One thing I don’t mention there, explicitly, is that I have a strong set of opinions about the world of software and the software developer’s place in that world. I think that software developers can and should be the bosses of the software development industry. And I write a lot about how to get there. I think of this as “developer populism,” and if this appeals to you, then read on. You are, of course, welcome to poke around my blog and site as you will. But I’ve curated some content here that I think you might enjoy if you’re new here. Think of this as a “start here” guide. First of all, here are some posts I think you might like. 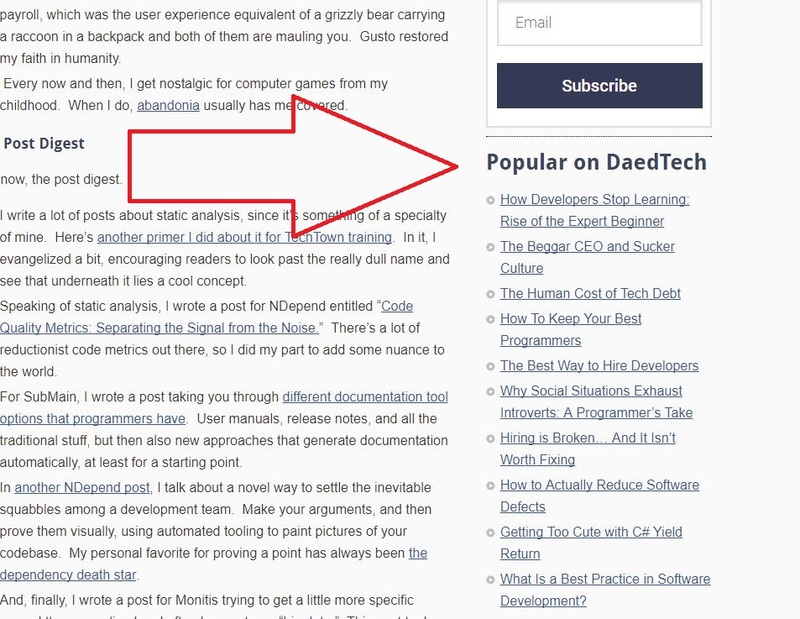 You could always check out the popular posts widget over to the right of the blog’s text. That’s essentially what the wide body of DaedTech readers think is most worth checking out. And perhaps they’re right. But think of this as editorial picks. Here are the posts that I feel represent DaedTech and the Developer Hegemony philosophy. This post, “Defining the Corporate Hierarchy,” is one I refer to regularly in other posts. In it, I lay the groundwork for the idea that the pyramid-shaped corporation is a terrible model for knowledge work, and I define corporate employees by what the corporation takes from them. In a post called, “Carnival Cash: The Cult of Seniority,” I talk about the idea of over-performing and about how being a low to mid level manager is a worse economic deal than being a software developer. I build on these ideas in a post about how “beggar CEOs” then expect us to work for no additional value. And in a similarly themed post, I point out that developer salary is a pretty bad deal, whether at $100K or $105K. So, instead of arguing for a few more scraps, tell the company to keep the salary and ask for better things. Job interviews are stupid. And tech interviews are especially stupid. I encourage you to bypass them and specialize. I have better ways of working in mind for software folks. That should be plenty to get you started on DaedTech posts. But if you want some things of mine to check out even beyond this site, here’s some additional links. I write a lot. I have a content marketing (writing) business for companies with developers as customers. You can check out this page for a list of some of the other places I write as well as podcasts, interviews and speaking engagements. 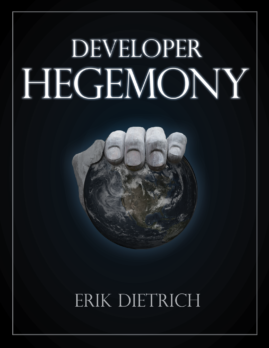 I wrote a booked called Developer Hegemony: The Future of Labor. It topped out as a #2 best seller on Amazon, in the category “Social Aspects of Tech Culture.” Maybe I’ll write another, rantier book later and get that elusive #1. (You can also find it on Leanpub, since I self published it). I’ve also written another, older book about office politics called The Expert Beginner. If you like the ideas in Developer Hegemony, there’s a Facebook group where you can talk to me. So thanks for stopping by! Hopefully you find some stuff here that you like. And remember to subscribe to the RSS feed. I generally publish new content three times per week.